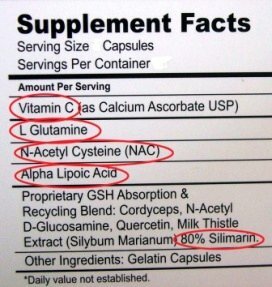 Not all glutathione supplements are created equal! Most glutathione supplements in the market contain glutathione itself. We know that glutathione is poorly tolerated orally. And that we must take in the glutathione precursors that our cells need to manufature glutathione. So, what to look for in a glutathione supplement? First,it must contain the glutathione precursors, particularly, n-acetyl cysteine. The other precursors which are glycine and glutamic acid are abundant in the body so there is no need for it. N-acetyl cysteine or NAC is the best source of cysteine in the market. NAC is readily absorbed by the body to yield cysteine, which in turn, is used to manufacture glutathione. Next to NAC, you should check if your glutathione supplement has Vit. C.
Vitamin C is a potent antioxidant in itself. Everything from the common colds to male infertility can use more Vitamin C in the body. Vitamin C, however, is not manufactured by the body. So, we must take it in our diet and through oral supplementstion. Why must Vitamin C be taken with NAC? Vit. C helps recycle glutathione once it has been used up by the body in quenching free radicals and toxins. The quenching of free radicals or the reduction-oxidation (redox)processes occur endlessly in the body. Therefore, glutathione is constantly used up by the body. In the presence of Vit. C, oxidized glutathione is recycled and converted to its reduced state once again. The opposite is also true. Oxidized Vit. C is converted back to its reduced form in the presence of glutathione. Vit. C is also needed for NAC to be absorbed across the cellular membrane. A dose of at least 1000mg is needed for this. NAC and Vit. C, therefore, are an item that must be present in your glutathione-boosting supplement. A must in your glutathione supplement is alpha-lipoic acid or ALA. Similar to Vit. C, ALA also helps in recycling glutathione in our cells. It also aids the cell to utilize NAC in glutathione production. ALA is considered a universal antioxidant because it is both water and fat-soluble. This means that as an antioxidant, it can work in all parts of the body. Alpha lipoic acid is one of the few aubstances that can pass the blood-brain barrier, a wall of tiny blood vessels. Because of this, it is being investigated as a treatment for brain and nervous system disorders that involve oxidative stress. There is no general recommended daily allowance for ALA. But the usual dose for antioxidant support is 20mg-50mg per day. So your glutathione supplement has NAC, Vit.C and ALA. How do you make sure they all form glutathione and they get absorbed by the body? For your glutathione supplement to effectively raise your glutathione levels, it must have ingredients that take care of the stomach, intestines and the liver. The liver is the biggest source of glutathione in the body where it is manufactured and stored. This is why it is very important to support the liver function when taking a glutathione supplement. Silymarin is a known ingredient that improves and restores liver function. It quenches free radicals and reduces toxicity. It also stimulates the creation of new liver cells. Silymarin is an extract of milk thistle. Aside from silymarin, quercetin is also a good liver protector. Its function is to eliminate toxic compounds in the liver. It also has antiviral, anti-inflammatory and anti-bacterial properties. Cordyceps is another ingredient that aids in liver protection. It is a fungus that is considered a medicinal mushroom in Oriental medicine.It has anti-inflammatory properties. It does so by reducing the thermostat for inflammation called nuclear factor kappa beta. Aside from liver protection, cordyceps is also beneficial due to its anti-cancer properties. Apart from the liver, protecting the gastrointestinal organs is vital in taking glutathione supplements. Every oral supplement has to pass through these organs. Therefore, for it to work, it must be able to pass throught the stomach and intestines. And at the same time, these organs must be protected from damage. GLUTAMINE is an essential substance for the support of the intestines. In fact, it is used as fuel in the small intestines. Glutamine helps preserve liver glutathione after a hepatic injury. And it also nourishes the GI tract, liver and immune system. N-acetyl-d-glucosamine (NAG) is a key precursor in the production of glycoproteins in the stomach mucus. As such, it protects the tissues of the gut mucosa from enzymes, acid and bacteria. It helps provide a surface to absorb nutrients more readily. Probiotics or "healthy bacteria" are likewise beneficial as they improve the microbial balance in the GI tract. Lactobacilli is an excellent probiotic that aids in the breaking down of nutrients and inhibit bad bacteria in the GI tract. Undenatured Whey protein is rich in naturally active immunoglobulins, essential amino acids and other nutrients critical for proper utilization of nutrients in the entire digestive system. All the ingredients mentioned above have been scientifally proven to work synergistically for glutathione production while supporting the body's liver and digestive organs to preserve existing stores of GSH. Not all glutathione supplements are created equal! Be sure that yours work by checking the label! To make it even more credible, check if it has a double blind study and composition patent. Then you're absolutely sure. REFERENCE: Keller, et.al., U.S. Patent No 6,262,019 for "Method of treatment of glutathione deficient mammals." Issued July 17,2001.